Passive POE is used more often then you would expect or probably know. Especially people who have used Mikrotik/Routerboard or Ubiquiti products before will know what it is and what it does. 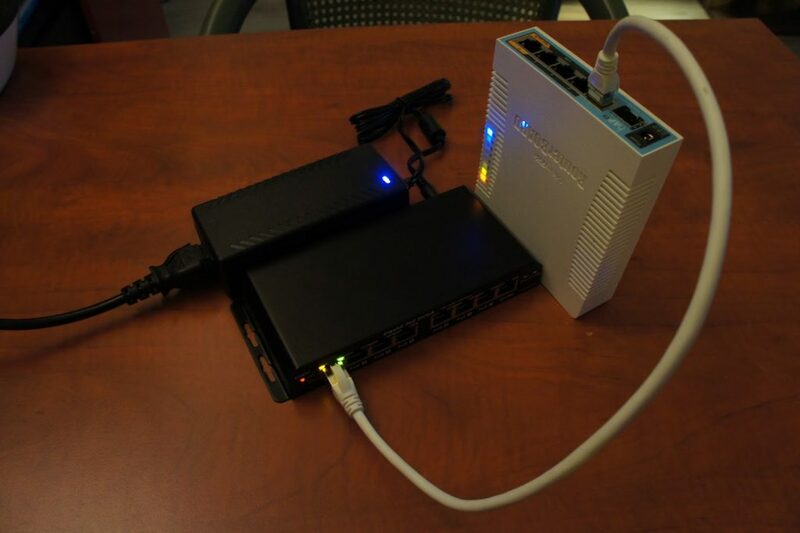 It allows you to send power over your ethernet cable to power the device it’s connected to. In a sense it’s the same as active POE (802.3af/at) but then a cheaper variant. Active POE requires active components on both sides of the link which then negotiate what is going to happen (power or no power). So plugging active POE into a non-POE device won’t result into the magic smoke being released like passive POE can cause. 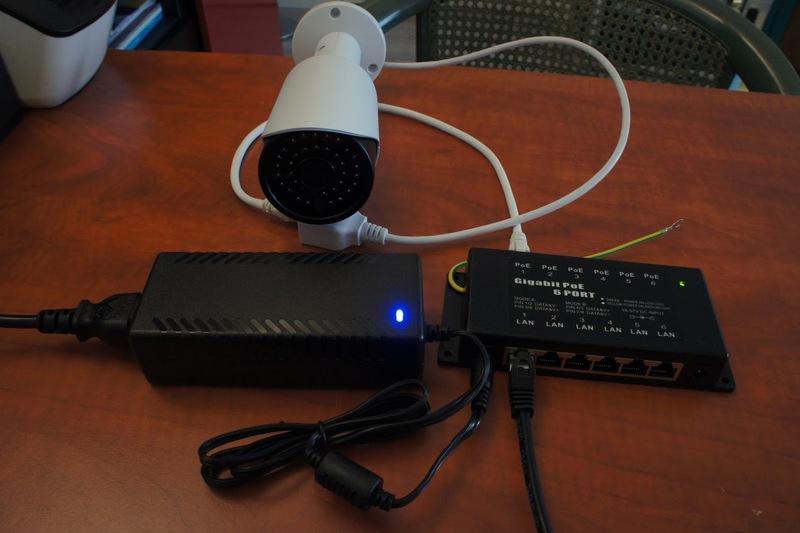 Passive POE in turn is a much cheaper solution then Active POE so it’s used in more low cost setups. Not that long ago, passive POE was limited to 100MBit max. This was because passive POE was using the 2 unused pairs of cable of the 4 pairs that are available in CAT5(e). This meant that both data and power was separated during transport. Very often you will see POE injectors like the following used for this. On the origin side you have a block which takes your network cable and power plug which then puts the power on your cable. On the other side you again have a block which splits the power and data signal again which you can then connect to your device. This worked well for 100Mbit links but it won’t work for Gigabit links or 802.3af/at compatible equipment. For this a new version of passive POE has been introduced which transfers the power over pairs which also transport data. 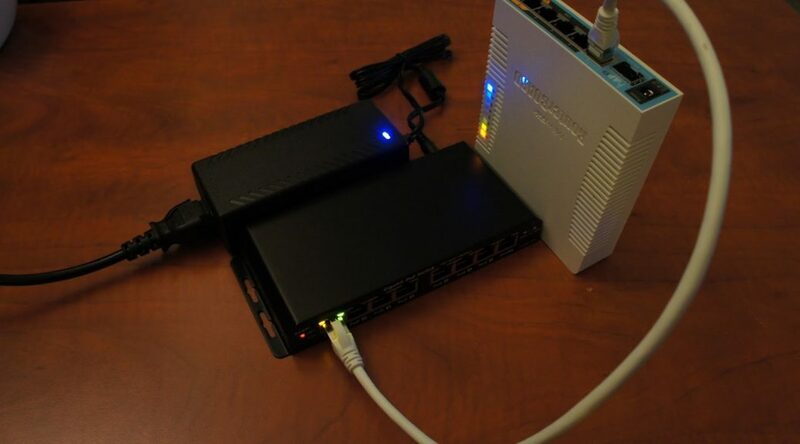 You can still inject the power using a block (A different version then above, you need a Gigabit POE injector block) but the end device will have to take the power and network out of the network cable itself so no more extractor block the functionality has to exist in your device! These devices can be POE version A or version B. Passive POE comes in two variants, version A and B. The main difference between these two is over which pairs you are receiving the power. Basically you could say that A is the same as active POE (802.3af/at) and version B is the passive POE standard. So basically, if you have an active POE (802.3af/at) compatible device, 99% of the time you can feed it with version A passive POE and it will run. The part that is not happening is the negotiating if power is needed or not, the cable just always has the power turned on. 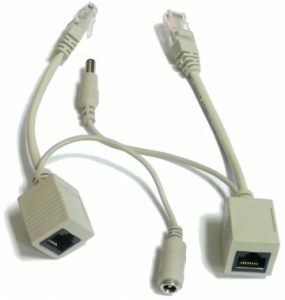 This works great, but be sure to never plug the cable into a non-POE A capable device! Version B has become the passive POE standard. 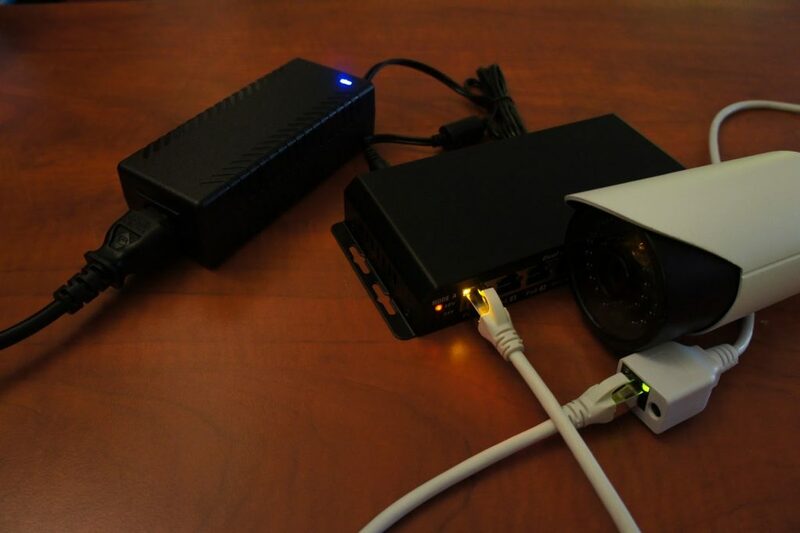 Equipment such as Mikrotik/Routerboard, Openmesh and Ubiquiti uses it. Some equipment will even accept both standards! These standards apply to both 100Mbit and Gigabit POE. For 100Mbit passive POE it will accept power using the same pairs as version B does. For version A this answer is simple. Active POE 802.3af/at or passively fed version A expects 48v. Officially active POE can use between 44v and 57v but the industry standard is to feed it with 48v. This should enable 100 meter cable runs without a too high voltage drop over the cable. Version B is a bit more difficult. Basically, every passive POE device will specify a voltage range it can accept. For Mikrotik/Routerboard or Ubiquiti you are almost always safe with 24v. A good rule of thumb is the higher voltage you use, the better it is because your voltage will drop less in procent compared to a lower voltage. This also results into a higher efficiency! 24v is a good middle voltage which is high enough to not suffer too much voltage drop over the cable but still provide enough voltage for the equipment on the other end. If your devices do not support any form of POE natively you can use injectors and extractors to still use the UTP cable to transport power. This will limit your transfer speeds to 100Mbit but this can still be useful for devices like IP camera’s or with a bit of tinkering a raspberry Pi for instance! Often these will be 12v devices so be mindful that this will not work for 100 meter cable spans. Up to about 20 meters should be fine though. You would use only the extractor block as seen in the above picture on the device side. As we all know wattage is calculated by multiplying voltage * amps. So a 24v 1A adapter will give you 24 watts. But, because of cable length there will be voltage drop so you need to oversize your power supply a little bit. A handy tool for this is using a voltage loss calculator. So it’s quite easy to calculate the total wattage you are going to need per device or for a shared injector/switch. Also because of the high 48v voltage voltage drop is always going to be minimal even at the maximum length of 100m. For version B you need to calculate depending on the voltage you are injecting and the average cable length. Let’s say you are running a 100 feet/30 meter CAT5E cable using copper (No CCA) pairs. After these 30 meters your 24v 1 Amp will be about 22.80v. That also means that you will only have 22.80 watts at the end of the cable. As long as your equipment is going to use less wattage then that, it should be fine. Otherwise you will need a higher wattage power supply or compensate for the voltage drop when injecting it (by using a higher voltage). Dropping a volt or even 2 shouldn’t be too much of a problem, depending on your starting voltage. If you are injecting 12v a drop of 1.20v drop would be more significant! A good rule of thumb would be that dropping more then 10% of voltage will not be acceptable. That means 1.2v at 24v is 5% but dropping 1.2v at 12v is 10% so not acceptable. So again, the higher voltage you can start with, the better, but make sure your equipment will also be able to handle it. When running different kinds of equipment with different wattage’s an average median for all the devices will need to be chosen. 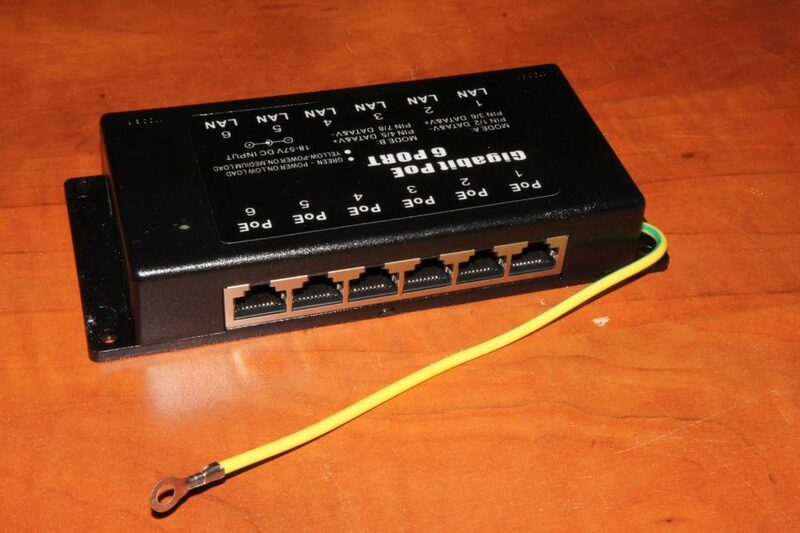 With that in mind, let’s say you wish to use 4x Mikrotik/Routerboard hAP AC as access-points in your house, and they need 17 watt max a piece, you would need to supply 68 watts total at the right voltage. Always be sure to over dimension your power needs a little bit. A good rule of thumb would be to add at least 25% more wattage then a maximum draw would use so in this case that would be ~85 watts. That also means your power supply will never run full draw continuously which will improve life span a lot! Because I wanted to test several injectors and wanted to dual-feed some equipment (Often Mikrotik/Routerboard equipment can be fed by using the plug (which is often 24v) and simultaneously be fed by passive POE with a slightly higher voltage, that way you have cheap redundant power!) I looked at several different injectors. – Each injector is suited for version A and B (not at the same time). They are equipped with two seperate voltage input plugs by which you can decide which version of passive POE you need! Do NOT plug them both in at the same time! – Each port on the injectors is equipped with a 650mA to 1A fuse! If a device has a short or something else goes wrong the port will automatically be disabled by the fuse and re-engage when the problem is fixed. 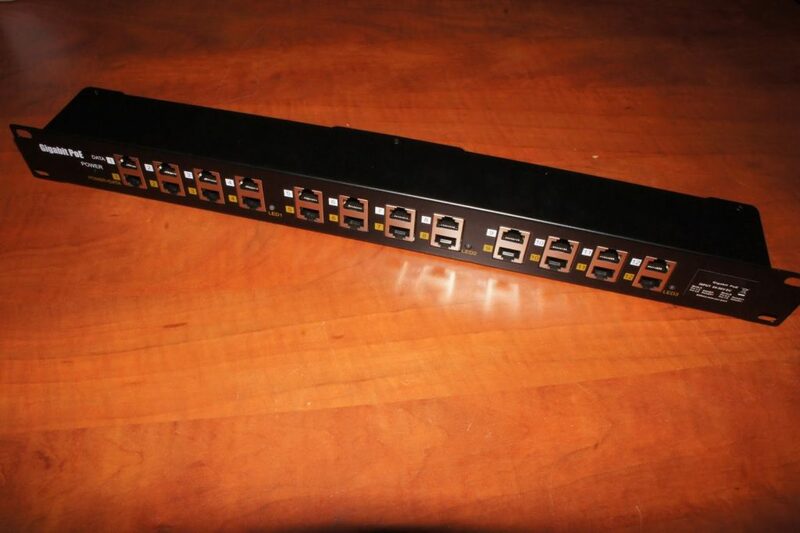 When you are not using a 19″ rack the 6 port Gigabit power injector is ideal. When feeding it with a certain voltage, let’s say 48v for version A it will distribute the voltage parallel over all the ports. And each port can use the wattage it needs. See the previous chapter to decide what wattage power supply you require! 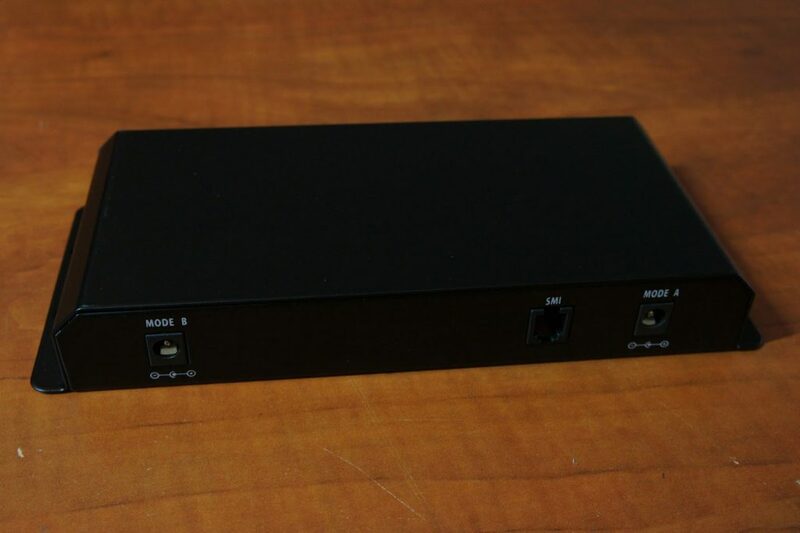 6 port Gigabit injector, easy screw holes on the side to mount it to a bracket or wall. Not much left to say about the 6 port version, next the 12 port 19″ version! 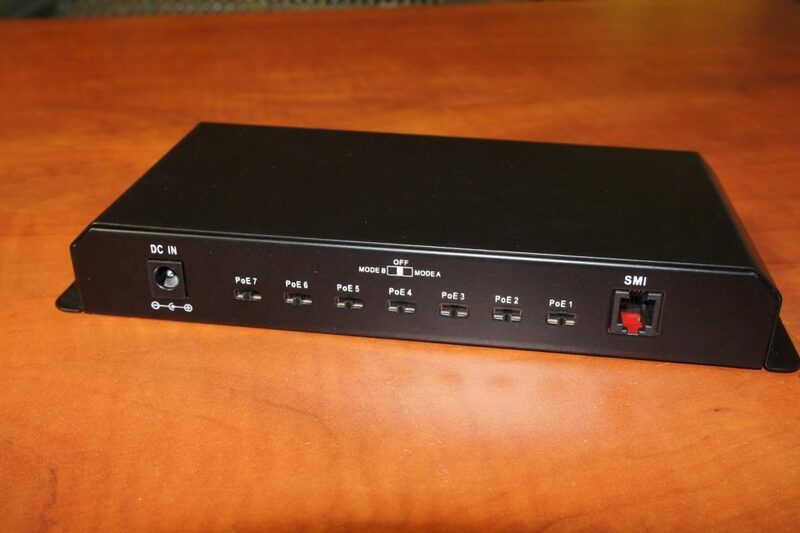 This version has all the features the 6 port version has but it’s made out of sturdy metal with 12 ports in a convenient 19″ format allowing you to incorporate it into your rack and have a tidy POE feed to your equipment. Not much else to be said about this version. It works great! 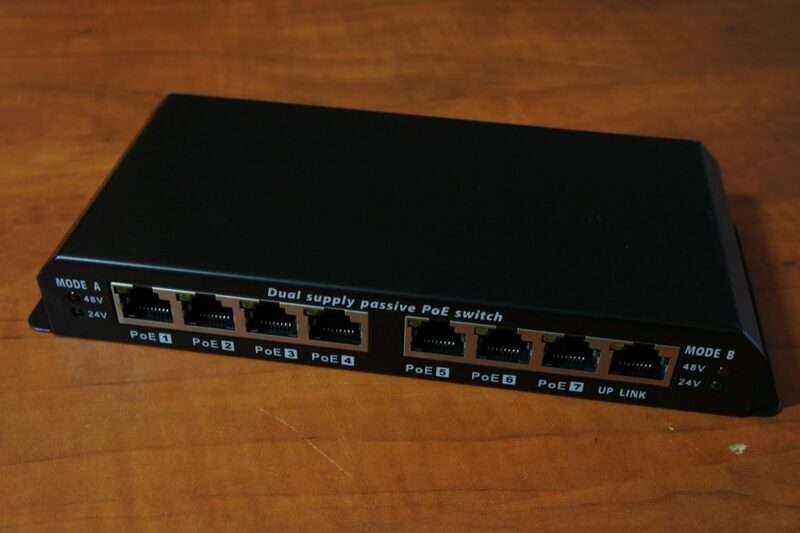 Other then using a passive POE injector (if you already have a switch) you can also use passive POE switches. This will cut down on the needed cables even more! 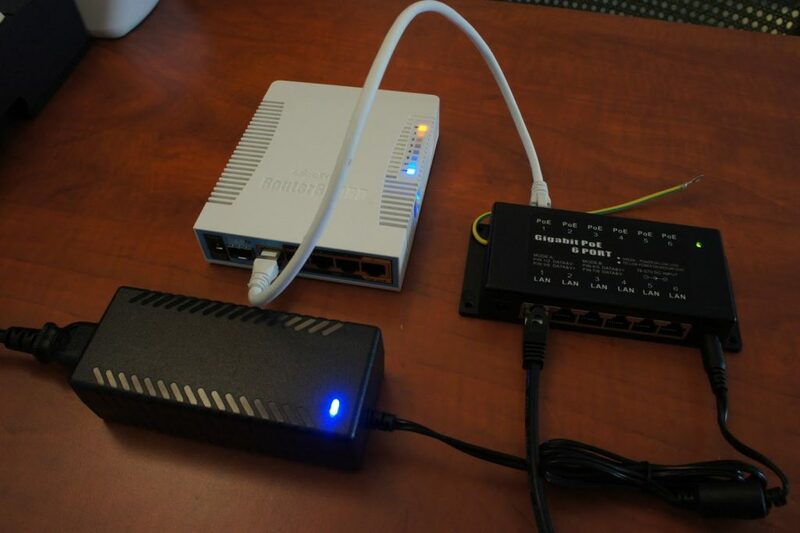 It’s a cheap version of a true managed active POE switch but this is a “dumb” switch with passive POE. These switches still keep all the features of the injector. You can use it with version A or B and it has the fuses installed, etc. 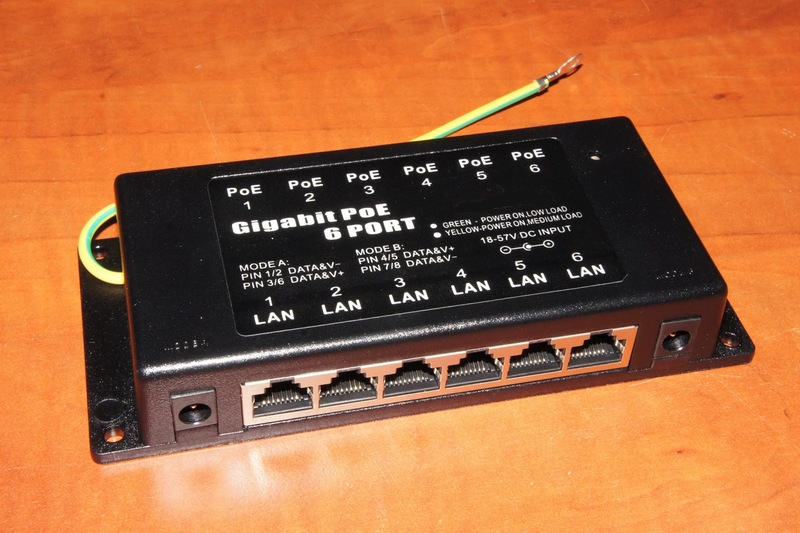 The Gigabit version has a switch per port with which you can choose to put that port in mode A or B so you can feed both types of equipment with just this one switch! 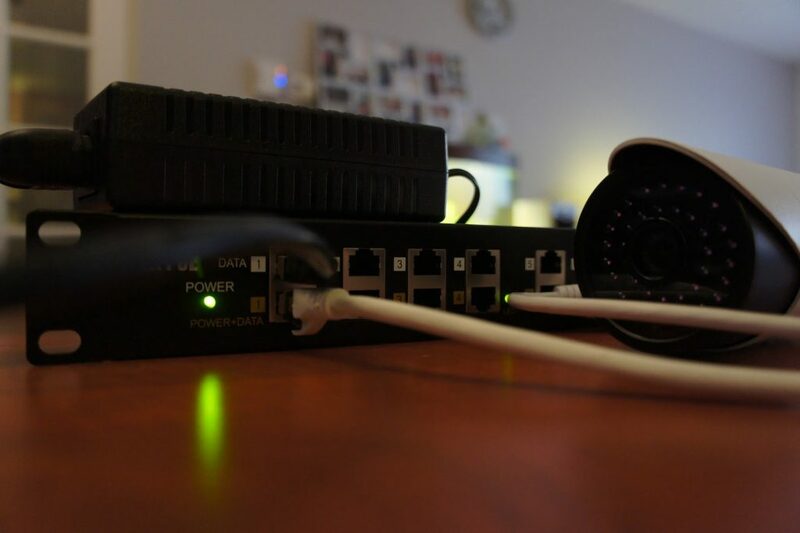 Choosing to use a switch or not all depends on expected bandwidth usage. The 100Mbit version for instance is great when you are running IP camera’s. Each camera is only going to use a max or 5 or 6Mbits of bandwidth so running up to 7 of those on a single 100Mbit switch would still only use 42Mbit! Plenty of bandwidth and it will save a lot of cables compared to an injector. The Gigabit version is more suited for higher bandwidth equipment such as access-points. 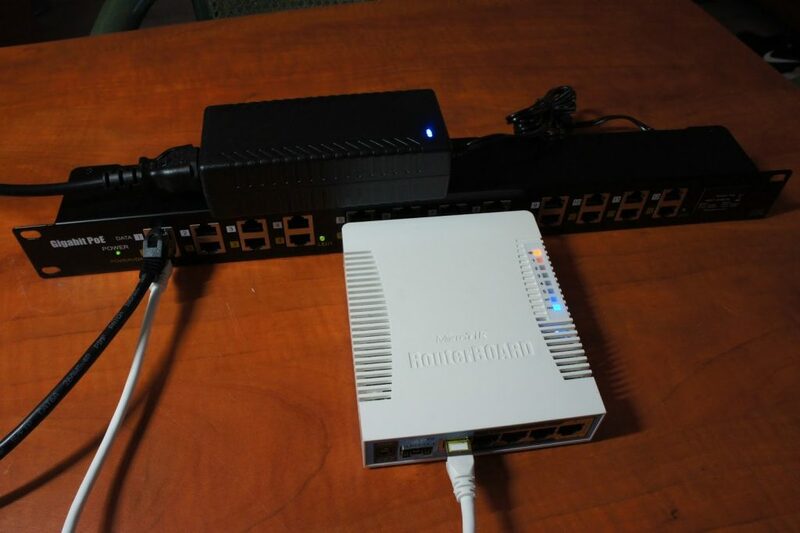 If you are running several N access-points having a gigabit of bandwidth for several of them will be more then enough! If you are running more then 2 or 3 AC access-points though I would advise using an injector instead of switch to not create a bottleneck in bandwidth. As said above, this switch can also be used for version A or B and it also has the fuses per port as the injectors have. Voltage input is variable but it’s advised to either use 24v or 48v depending on your needs. This switch is very much the same as the above one but it switches at Gigabit speeds. A unique feature of the gigabit version is that you can selected to use no output, version A or version B per port on the back! You can use it with a variable voltage input but 24v or 48v is recommended. And that’s that. During the testing I did all the equipment I had worked perfectly. Both version A equipment and version B equipment booted right up and worked perfectly stable. Connecting additional devices either to the injectors or switches did not interrupt power to the running devices and they shared a single power supply without issue (Be sure to size your power supply correctly, see above). If you want to run some IP camera’s and/or access-points at home I would very much recommend using one of these injectors or switches to provide them with power. Using separate injectors for each device quickly turns into an unmanageable mess in my experience and requires a lot of power sockets, etc. It’s just not very practical. Using an injector and especially a switch solves this problem all together and allows you to neatly setup everything! Also using a single adapter often saves you power because of a more efficient conversion. The only downside to passive POE? Never ever plug a passive POE fed network cable into a non-passive POE accepting device you will make the magic smoke appear and most probably kill it’s network port. If you are careful with that one downside it can be a lot cheaper then getting official POE devices and/or switches! Questions or remarks are very welcome and if you wish to buy any of these devices be sure to contact me! Woah! This combined with the hAP AC mikrotiks looks like just the stuff I need for my new place. PoE gigabit switch -> 3x hAP AC (1 for each floor) and I'm done. Yeah, that's what I'm going to do too. As I mentioned I have some stuff for sale so if you are looking to buy, let me know! Forgot to mention. I also wanted to route multiple Gigabit in my home, have 10Gbit switch connections (CRS226) and be able to handle a Gigabit Internet connection. I've been running the CCR1009 for a while now and it's performing awesome! So I can definitely recommend it, it should suit almost any needs you might have! More articles about that coming up in the future! 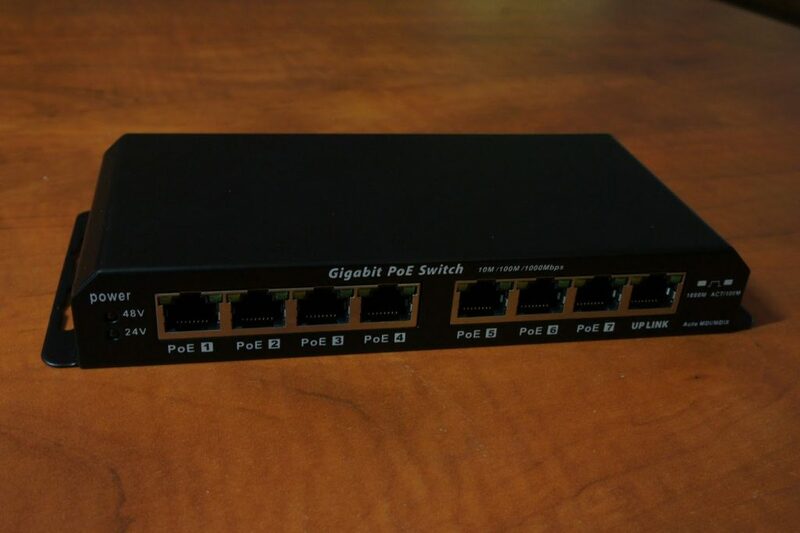 What brand is the Gigabit passive POE switch? Where to buy? Yeah,This PoE Injector review is great,If also write the different of the “active poe injector” & “passive poe injector”.It will be much better. This really gave me an insight into the differences I need to be aware of when setting up the POE runs in my home network. By the way, you use the word ‘then’ quite a lot, instead of ‘than’ in your text; eg: ‘…more then words…’ – just wanted to let you know for future writing!